The staff at Sullivan Companion Animal Clinic in Aurora, Nebraska are dedicated to helping you and your pets. Whether you're pet needs a standard checkup or surgery, you can count on our staff to ensure your pet will be comfortable during his visit. Our services range from dental services to grooming; boarding to surgery. Check out what we all do! Questions? Contact us today! I was born and raised in Clay Center, NE, attended the University of Nebraska at Lincoln for four years and graduated from Iowa State University College of Veterinary Medicine in 1990. 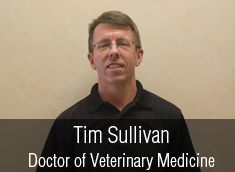 I have practiced veterinary medicine in Aurora, NE since that time and focusing exclusively on small animal medicine at Sullivan Companion Animal Clinic since 1998. My wife, Lisa, and I have 3 sons: Trevor, studying Civil Engineering at UNL; Jared, a senior at Aurora High School who will study Animal Science at UNL; and Kyle, a 6th grader at Aurora Middle School. Other family members include: Spaulding (a King Charles Spaniel), two ducks, numerous fish, a salamander, two geckos and, of course, our four clinic cats. I was raised on a farm near Shickley, NE, and graduated from the University of Nebraska at Lincoln in 1988 with a degree in Business Education. In the past, I taught business courses at SCC - Lincoln, worked as a paralegal in Lincoln and Omaha, and worked as a substitute teacher at Aurora Public Schools. I joined Sullivan Companion Animal Clinic in November 2011 as bookkeeper/office assistant. My husband, Scott, and I have lived in Aurora since 1997 and have two sons, Samuel and Alex. Our family also includes three cats (Simba, Mufasa and Nala) and one goldfish.